First published in 1999, this volume provide a useful contribution to global CO2 mitigation in an effort towards effective climate protection achieved through national and international efforts. This volume forms part of an international monograph publishing series covering new research into the ‘green’ issues such as government, corporate and public responses to environmental hazards, the economics of green policies and the effectiveness of environmental protection programmes. Part 1. National Strategies and Programmes. 1. 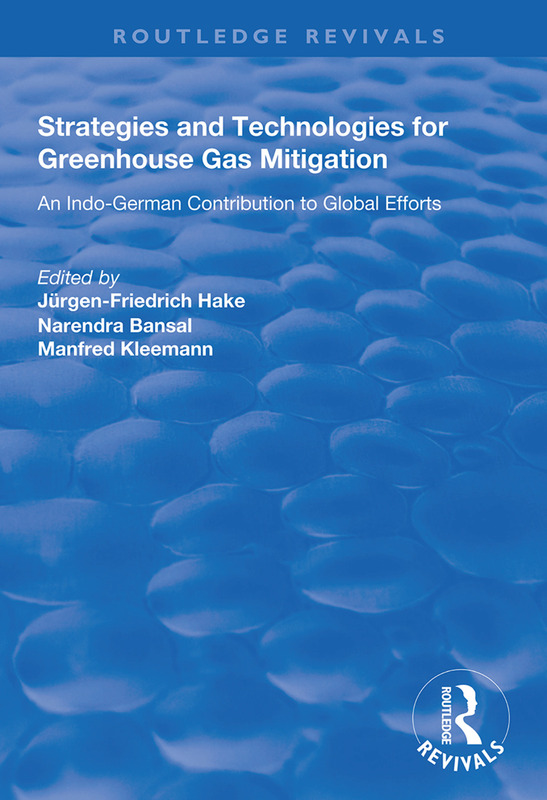 Greenhouse Gas Mitigation Strategies in Germany and the European Community. Jürgen-Friedrich Hake and Wilhelm Kuckshinrichs. 2. Programme of Measures to Reduce CO2 Emissions in Germany. Manfred Kleemann. 3. Development of Carbon Dioxide Emissions in India. Narendra Bansal. 4. Global Emission Aspects and Proposals for "No Regret" Measures in India. Murari Lal. Part 2. Renewable Energies for Climate Protection. 5. Status of Renewable Energy Utilization in the Federal Republic of Germany. Hermann-Josef Wagner. 6. Renewable Energy for Power Generation Under Changing Conditions in Germany. Jürgen-Friedrich Hake, Peter Markewitz and Dag Martinsen. 7. Photovoltaics in Germany: Between Efficiency and Cost. Jens Simon and Heribert Wagner. 8. Potentials and Constraints of Wind Energy Utilization for Climate Protection in Germany. Manfred Kleemann. 9. Utilization of Biomass in the German Energy Sector. Martin Kaltschmitt. 10. CO2 Reduction Potentials Through Renewable Energy Sources and Rational Energy Use in India. Narendra Bansal. 11. Status of Photovoltaic Science and Technology in India. Viresh Dutta and Prabhat Kumar Koner. 12. The Photovoltaic Promotion Programme in India. Bharat Bhargava. 13. Wind Power Development in India. Ajit Gupta. 14. Biomass-Based Power Generation Prospects in India. Sudhir Mohan and Jayant Ramakrishna Meshram. Part 3. Reduction Options in the Residential Sector. 15. Instruments to Realize Energy Saving Potentials in the German Residential Sector. Wolfgang Feist and Witta Ebel. 16. A Modelling Approach to Energy Saving and CO2 Mitigation in the Residential Sector of Germany. Rainer Heckler. 17. Energy Requirements and Alternate Energy Uses in the Residential Sector of India. Narendra Bansal and Hari Prakash Garg. 18. Analysis of a Residential Building in India Through Modelling Techniques. Mahabir Singh Bhandari. 19. Modelling Energy Savings and CO2 Mitigation in the Residential Sector in India. Sujata Gupta, Ritu Mathur and Leena Srivstava.